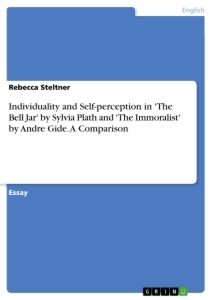 Individuality and self-perception are the main themes of both, The Bell Jar by Sylvia Plath and André Gide’s The Immoralist. This is so on at least two levels. Both their stories are presented by an unreliable and probably even biased narrator, who is also the main character; Michel in The Immoralist and Esther in The Bell Jar. This may be a remainder of the strong autobiographical character of these works. It is this similarity, which makes it very interesting to compare those novels with regard to the question of how individuality is portrayed and how the characters perceive themselves. Of course, there is not enough room here, to discuss, in what ways those novels reflect their authors and how authentic they are. As these are both works of fiction, we have to be very careful as not to just translate ‘Ester’ as Sylvia and ‘Michel’ as André. We can only say, that on the first level, we have these fictional characters, who have a certain outlook on life and how they fit into the world as they perceive it - and this will be our main concern – but on a ‘meta-level’ we have the authors’ ideas on how we perceive ourselves and what individuality is. I would argue that this is an experience, which cannot be transgressed; it is something personal, that we can never get rid of. So when, Sylvia Plath invents the figure Esther, her perception of herself and the world around her cannot be completely different from her creator’s perspective. But just as it cannot be wholly different it cannot be complete either. What is worked into such fictitious characters are just elements of ourselves and sometimes they can represent earlier stages in our development – earlier selves both of the character and probably also of their authors. In these two novels, this is especially obvious, because both end with a trial-like situation, where the characters and their development are to be judged; in Ester’s case this is by psychologists and in Michel’s by his friends. In The Immoralist, this is further emphasized, because we have this frame of the letters to his friends and his telling the story to present himself in a positive light and thus to defend himself. This aspect of defending one’s decisions is not as present in The Bell Jar, but we have her idea of writing a novel to “fix a lot of people”, (p. 115). And we should better keep this in mind when we think about how biased their narrations are. “I have lived it for four years, and have written it to put it behind me. I suffer a book as one suffers an illness.”, Gide quoted by A. Sheridan in his introduction to The Immoralist, p. viii. “The solution adopted in almost all Gide’s fiction is that of the first-person narrator, one by definition partial in viewpoint and possessed only of partial knowledge.“, Alan Sheridan, p. xi. The Significance of Maternal Relationships in Sylvia Plath's Novel "The Bell Jar"
Postcolonial concepts of hybridity and identity in Carlos Fuentes‘ "Aura"